The tool I’ve found most useful is called Contrast-A. Contrast-A is available as a Web-based application and as an Adobe AIR application, so it can easily be used on all platforms. To use Contrast-A, you simply enter one color value (in hexadecimal or RGB), then enter the second color value. Contrast-A will then show a sample of the first color as a foreground and the second color as a background, and vice-versa. 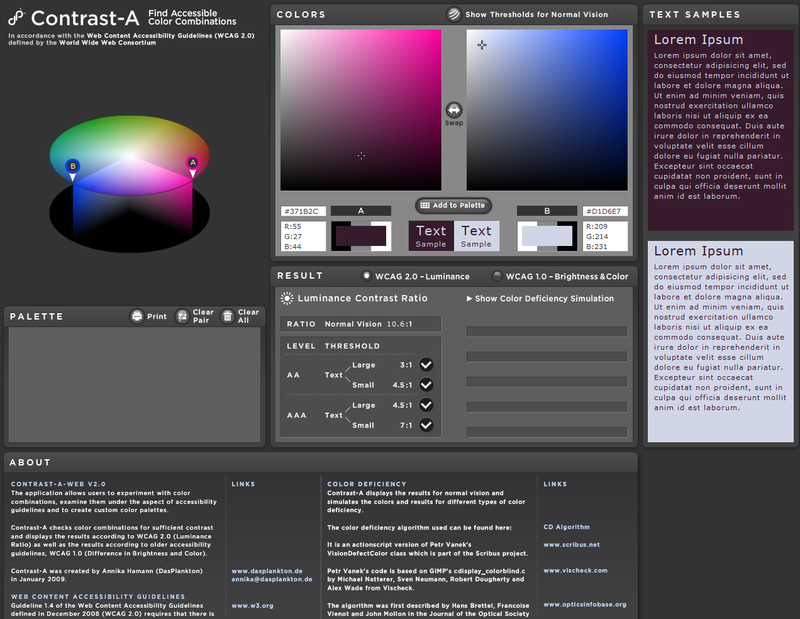 Samples of larger text (18px or larger) and normal text (~12px) are shown in the display, along with a color wheel. Then, below the samples, is information about the contrast between the two current colors and a simple checklist letting you know if the two colors have enough contrast to meet the WCAG recommendation. 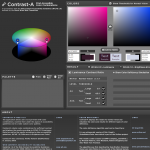 Finally, Contrast-A even includes a color-deficiency simulator to attempt to let you see how the contrast appears to users with various color-deficiencies. Contrast-A is a very handy tool, offers a great amount of information and is extremely simple to use. If you are not contrast-testing your website with a tool like Contrast-A, you really should be. As a color-blind user, I implore you to do proper contrast-testing to make it easier for me to use your sites.